In partnership with other conservation and trails organizations, AMC recently filed an injunction in Federal court challenging the approval by the National Park Service of the Susquehanna to Roseland transmission line in NJ & PA, slicing through the heart of the Delaware Water Gap, the Appalachian Trail and the Delaware River, which is federally recognized under the Wild & Scenic Rivers Act. AMC has a long history of conservation and recreation in the Delaware Water Gap. We worked to save this unique natural area from the Tocks Island Dam project over 40 years ago. Our volunteers have invested over 50,000 hours building and maintaining trails there, and each year we introduce over 10,000 people to the area through the Mohican Outdoor Center and Chapter trips. Millions of people from New York City and Philadelphia find respite in the area’s magnificent views and recreational opportunities. AMC opposes the project because of its impacts to trails and scenic views. 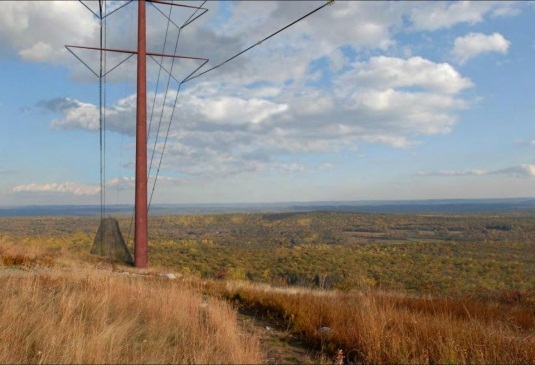 The transmission line will cross sensitive and unique resources and permasnently scar the Delaware Water Gap. The Park Service itself acknowledges the project will have significant and irreversible adverse impacts, including irreparable harm to wetlands that support rare plant and wildlife species, degradation of visitor experience, and detrimental impacts on viewsheds from 195-feet tall transmission towers. The National Park Service’s rendition of the proposed transmission line.